Get your geek on with fandom ring ideas! Check out this recreation of the Ring of Barahir (worn by Aragorn in the movie versions of Lord of the Rings) by our sponsor, Joseph Jewelry! These guys are so totally down with bringing all your custom ring design options to life. We've already talked about some tips for making the design-it-yourself ring process easy-peasy, but I've been scoping out the rings in Joseph Jewelry's custom ring section and have been ultra inspired in a full-on geektastic way. Let's start dreaming about taking existing rings and transforming them into fandom-friendly visions of awesome. This ring called to us to merge it with Arwen's necklace from the Lord of the Rings films. You know, this one. Have the artists at Joseph Jewelry turn that filigree into a symbol of everlasting life love. Ooh, a necklace version exists, too! I sense a theme. Take this band, swap the diamonds for triangular yellow sapphires, and you're looking at some subtle Triforce goodness going on here. Tell me this blue sapphire and diamond ring isn't screaming to be turned into R2-D2. Lose the filigree on the sides, add in a couple of rectangular blue sapphires instead, tweak the diamond/sapphire ratio in the circle, and this WILL be the ring you're looking for. Ooh, and here's a wedding band version ripe for the same treatment. Or even easier, take a sweet little solitaire or wedding band and add some "I love you, I know" engraving. Does this ring remind you of those Death Eater masks, or what? You could totally have Joseph Jewelry turn it into one of the masks, the skull from the Dark Mark, or hell, this ring as it is blows me away. If you're not quite into some He-Who-Must-Not-Be-Named-inspired styles, maybe have them create a little Deathly Hallows symbol with a stone in the middle or have them engrave "Always" into a band. Oh, Snape, our problematic fave. This one is already pretty Emerald City as it is, but I think adding in some slim pink trillion rubellites or ruby accents on the side would give just a hint of the poppies in front of the Emerald City. Give the artists at Joseph Jewelry a photo of the TARDIS, add a little engraving to the sides of this bad boy, and allons-y — a timey-wimey ring for your Doctor Who-themed wedding (or just a little nod to your favorite fandom in a more traditional setting). Ready to start your own ring? Trust me, these artists are pros and will totally translate your needs into an amazing creation. Go lose yourself for an afternoon in their custom tools! Now it's YOUR turn to tell us all about your dream ring. Are you thinking a golden snitch? Renaissance faire-inspired filigree? Share it in the comments below! How do you transition from ceremony to reception when they're in the same space? Don't forget the video game lovers. 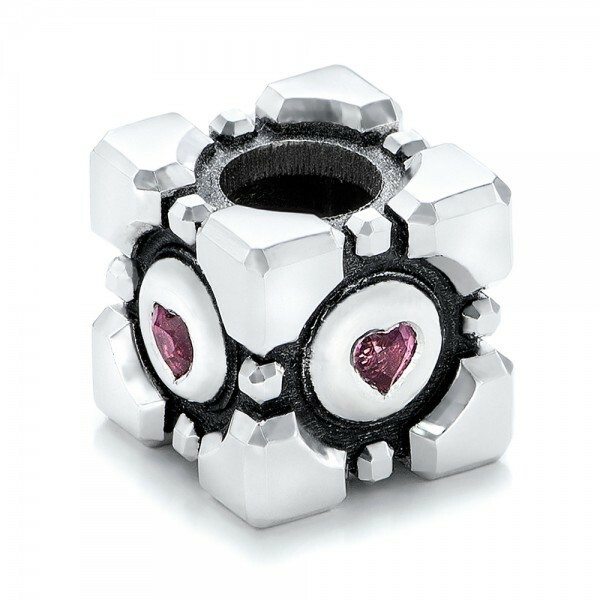 The Companion Cube from Portal. Speaking of video game lovers rings, my future husband and I have matching Borderlands rings. Man, I wish I knew about these guys before we picked out our rings!! This is super cool. Tell me I'm the only person who saw these and immediately thought "tentacle monster!"